Introducing a new project in fiscal 2019 ! 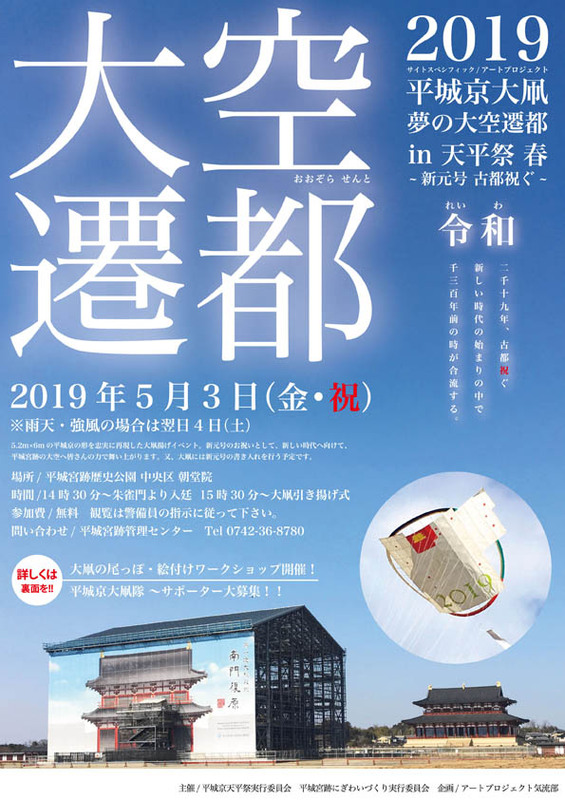 The New Japanese era "Reiwa" has the meaning that the culture is born and nurtured while people meet each other.In the transition to the new era, we will carry out a festive great kiteproject at the Nara palace site park! 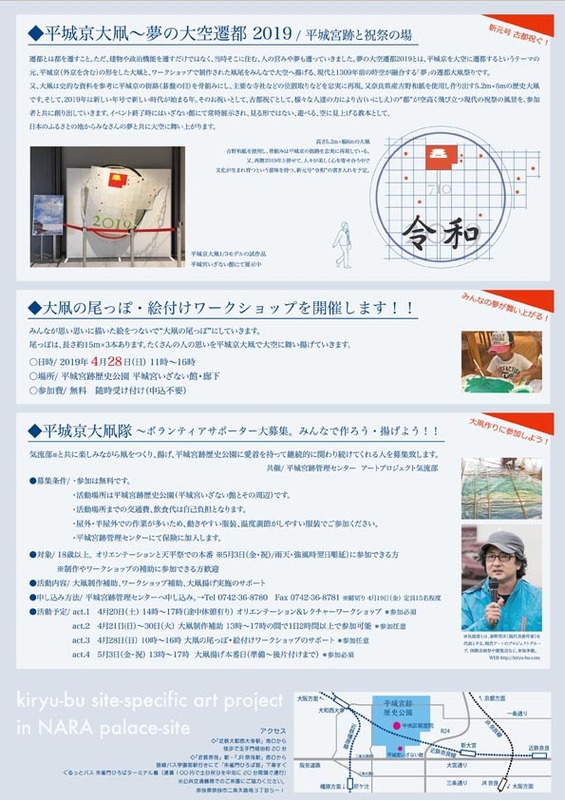 ※ together, recruiting and supporters to participate in the large kite making, is held information workshops (bottom). To change capital. However, not only the transition of buildings and political functions, but also the living and dreams of people who lived there at that time. Under the theme of the capitalization of Heijokyo to the sky, with everyone's dream of Great kite Translocation 2019, everyone flies the Great kite in the shape of Heijokyo (including the outside) and the tail of the kite produced in the workshop to the sky, It is a festival of "dream" where the present and the time of 1309 years are united. In addition, the kite framed the streets (board) of Heijokyo with reference to historical materials and faithfully reproduced the location of major temples and shrines. 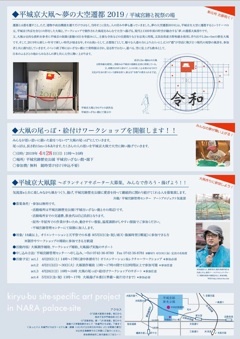 In addition, it is a 5.2m x 6m history kite created using Yoshino washi from Nara Prefecture. And, 2019 is the year when a new era begins with a new year. To celebrate the old city, together with the participants, we will create the scenery of a modern festival in which the ancient "city" flies high above the sky by the power of various people. 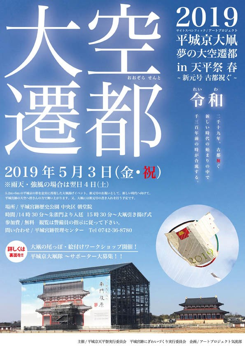 At the end of the event, it will be constantly displayed in the Izanai Exhibition Hall, and will play in the sky as a textbook to look up in the sky from the Japanese hometown-Nara with your dreams. In addition, along with 2019 AD, we plan to write in the new Japanese era "Reiwa", which means that culture will be born and nurtured while people keep their hearts together.